1/2 lb. Angus beef topped with lettuce, tomato, sweet onion and pickles. Roasted chicken breasts chopped and mixed with a house mayonnaise blend, fresh grapes, celery, onions and fresh tarragon. Served on multigrain bread with lettuce and tomato. A Buffalo staple! The best roast beef sandwich in America!! 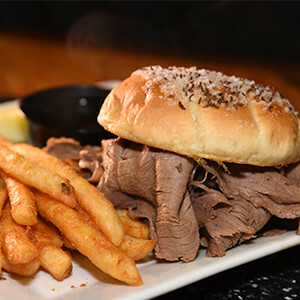 Thinly sliced rib-eye steak piled high on a Kummelweck (salt and caraway seeds) roll with side of horseradish and au jus. Thinly shaved corned beef grilled to perfection on rye bread, with sauerkraut, swiss cheese and 1000 island dressing. Crispy tenders lightly breaded and fried. Served plain or tossed in one of our specialty sauces with a side of celery and choice of dressing. Three fresh ground chuck sliders served with American cheese, sauteed onion and pickles.